Take your next conference from good to great with our mobile coffee catering for conferences across Melbourne. Maximise your brand exposure and networking opportunities with fresh hot beverages branded with your logo. A busy conference stand leads to a happy boss. Ensure visitors spend most of their time at your trade stand instead of your competitors’, with high-quality coffee that’s made right there by a skilled barista. We’ll focus on pulling people in, while you focus on converting leads and making valuable contacts. 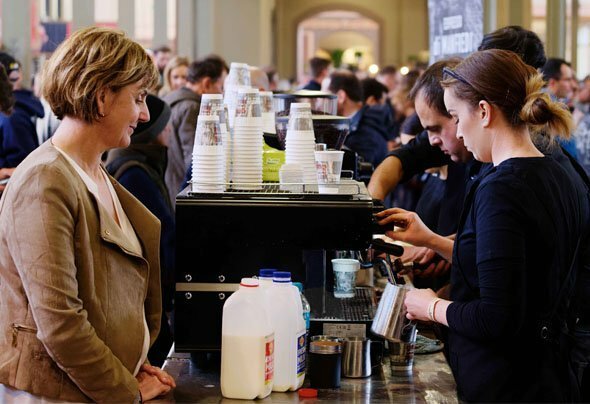 Whether you’re on the organising team for an entire conference in your industry, or your business is setting up a trade stand at an upcoming event, a mobile coffee cart can add a new feature of attraction that keeps the crowds happy. Don’t run the risk of a subpar or short-lived event, but deliver exceptional conferences with coffee cart hire from 92 Degree Espresso. Our coffee carts are stylish and attractive and always come complete with a professional barista that has been trained by the best in the business. As we’re representing your brand, we guarantee your entire mobile coffee cart will be aesthetically-pleasing and your barista will provide consistently high-quality customer service. As well as conferences, our mobile coffee carts are the ideal choice for brand activation events and trade shows. Since 2012, we’ve been dedicated to providing a quality of coffee and service that is on another level. No request is too big or too complicated, and we’ve always made it our mission to fulfil unusual enquiries in the most streamlined ways. Thinking of adding mobile coffee catering to your conference? 92 Degree Espresso makes it possible, through our transparent pricing structure and honest communication. With no hidden costs, and flexible prices, you know exactly what you’re paying for when you book a coffee cart for Melbourne conferences with us. Contact us today for a quote and our team will get back to you shortly. Simply send us an email on coffee@92degree.com.au or give us a call on 0468 365 201. Copyright © 2019, 92 Degree Espresso. All Rights Reserved.